Take a good look beneath the towering smokestacks of the Dickerson Power Plant. Focus on the 900-foot, concrete lined discharge channel where 300,000 gallons of water per minute are borrowed to cool steam pipes and returned to the Potomac River. You might see a future Olympian. In 1991, the discharge channel was modified to serve as the first and perhaps only heated artificial kayak racing course in the country. 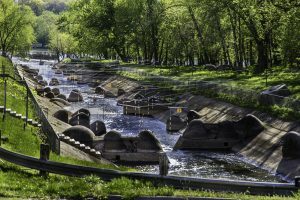 PEPCO, the power plant’s builder, with design help from The U.S. Navy’s Taylor Model Boat Basin, positioned 75 boulders in the channel (some as heavy as 17 tons!) to create the whitewater needed for the racers. Warmer water from the plant returning to the river makes the course suitable for virtually year-round kayak training. The course was first used for kayakers training to compete in the 1992 Olympics, and it is currently being run by the Potomac Whitewater Racing Center. The candy-striped poles dangling above the channel mark the course.